ATLANTA - March 27, 2013 - PRLog -- Grayson, GA – Today Project Paws Alive and Groupon Grassroots, the philanthropic arm of Groupon, announce the launch of a nationwide campaign to provide Bullet and Stab Protective Vests to Law Enforcement K-9s. Project Paws Alive, Inc. is the non-profit organization and charity partner selected by Groupon Grassroots to participate in this nationwide initiative. The Vests for K-9s campaign will be available on the Atlanta, GA Groupon Grassroots page beginning on Thursday, March 28th and running through midnight Wednesday, April 3rd, 2013. Utilizing Groupon Grassroots’ collective action model and secure website, folks can pledge support for the Vests for K-9s initiative in increments of $10 (which is a tax deductible donation) with each $800 providing a law enforcement K-9 with a customized, bullet and stab protective vest. Within the US, six law enforcement K-9s were killed or seriously injured in the line of duty in the last week alone. Providing police K-9s with protective vests is an investment in our communities and public safety. Many agencies don’t have the budget to purchase this equipment. Project Paws Alive’s mission is to provide these vital protective vests to the law enforcement K-9s who put their lives on the line for the community and their human partners. The goal is to raise $40,000 by the end of the event on Wednesday which will allow the organization to outfit 50 police K-9s with vests throughout the United States. Project Paws Alive just vested K-9 Zeke; the Harrisburg, PA Police K-9 that was shot while pursuing a wanted person in Lower Paxton Township on March 15th. After two hours of intense surgery to remove a bullet, K-9 Zeke is now recovering at home with his partner Corporal Ty Meik. “It’s our goal to provide law enforcement K-9s nationwide with these bullet and stab proof vests to protect them while they are protecting us”. 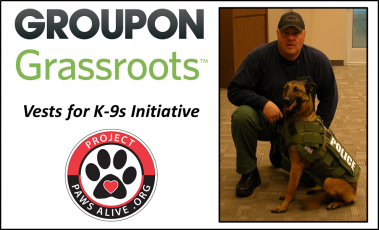 One hundred percent of the Groupon Grassroots campaign proceeds will be used to provide law enforcement K-9s with customized, state of the art bullet and stab protective vests. Project Paws Alive, Inc. is a 501c (3) all volunteer charity located in Grayson, GA. whose mission is to help public safety officials and first responders save the lives of domestic pets with specially designed pet oxygen mask recovery kits, and to provide stab & bullet proof protective vests and trauma kits to law enforcement and military K-9s throughout the United States. Project Paws Alive relies solely on donations and sponsors to fund this lifesaving equipment. Project Paws Alive, Inc. currently has a list of over 30 K-9s needing vests. For more information or to learn about volunteer opportunities, please call 770.714.7994. Tax deductible donations and event listings are via the website: http://www.ProjectPawsAlive.org. Groupon Grassroots, launched in July 2010 in Chicago as G-Team, features local campaigns nationwide, enabling Groupon followers to do good, have fun, and make a real impact in their communities. Groupon Grassroots uses collective action to gather support for worthwhile causes and produce tangible results for local organizations. To learn more about Groupon Grassroots and how to become a featured organization, visit http://grassroots.groupon.com. To subscribe to Groupon, visit http://www.groupon.com. : Project Paws Alive, Inc.
Analytical Forensic Associates Joins Project Paws Alive to Vest Snellville PD K-9s.